Ophelia is treated with profound respect in this production—or, at least her blue scarf is. And so is the shawl representing Gertrude. I collect things. In case you didn't notice. It's my mother's DNA. She, by turns, gathered into her home bells, decorative eggs, collectable plates (not an inch of wall in the house was visible), brass rubbings, baseball cards, baseball anything, teddy bears—when she died, she had at least 3,000 teddy bears and other plush critters. That's obsessive compulsive. Yeah, I've got that gene, too, but I've learned how to place boundaries on it. As is the case with William Shakespeare: I don't try to see every production out there, but like any serious collector—and not just the OC-type—I seek out the unusual as well as the significant and the craftwork for which I have a personal fondness. My collection of 25 staged Hamlets, for example, includes a wordless version, a commedia dell'arte version, a First Quarto version, a four-person production, three one-person productions (a one-woman digest, a one-man complete play, and a one-man Iranian adaptation), and a one-woman-but-actually-four-women production presented through Ophelia's perspective. Top, Gertrude (Hannah Sweet, right) tries to calm Laertes (Nicola Collett) as Fortinbras hangs around in the background in A Two Woman Hamlet at WSC Avant Bard. Above, Hamlet (Collett, left) discusses his father's ghost with Horatio (Sweet). Photos by Mara Sherman, WSC Avant Bard. Now I've added to my treasures a two-woman Hamlet called A Two Woman Hamlet. WSC Avant Bard capped its annual Scripts in Play Festival with a revival of this show, which had a sold-out run in the 2018 Capital Fringe Festival last summer. In Avant Bard's nearly three-decade history of producing "theater on the edge" (its slogan) in the Washington, D.C., area, this is its first guest production, something the company would like to do more often. Avant Bard is currently residing at the Gunston Arts Center in Arlington, Virginia, occupying a studio theater that on this evening has two 30-seat risers set catty-corner to each other forming a triangular play space. At the back are two coat stands made from white PCB piping. On these hang a red coat, scarf, hat, shawl, vest, and a shovel. Two chairs, set on opposite sides of the play space, also have clothing draped on them. 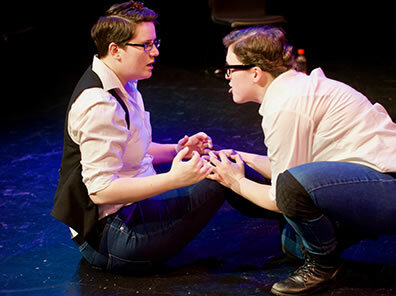 The two women of the production's title, Hannah Sweet and Nicola Collett, both wear white, long-sleeve, button-down shirts, blue jeans, boots, and knee pads. Some of the minimal-actor Hamlets I've seen are little more than theatrical stunts, though the above-mentioned one-woman-but-actually-four-woman production, Taffety Punk's 2014 Enter Ophelia, distracted, remains among the most powerful theater pieces I've seen. Nevertheless, in all these Hamlets, actors bring their own particular insights to a play that's been analyzed and even played every which way over the years but still has the capacity to surprise. Sweet and Collett present their 80-minute Hamlet with a sketch-comedy vibe, but they nonetheless delve into some emotional conundrums in the work and contribute their own interesting perspectives. Each brings Shakespeare experience to the project. Both were in the cast of Brave Spirit's 2015 Henry IV, Parts One and Two, Collett played Claudio in a Britches and Hose production of Measure for Measure, and Sweet played countless characters in Faction of Fools' Henry V last fall (the final entry in Shakespeareances.com's Shakespeare Canon Project: 42 Plays, 42 Theaters, One Year). Sweet's brilliant commedia dell'arte work in that Henry V is more instructive in this Two Woman Hamlet than the duo's Shakespearean skills. Sweet transforms her physicality from role to role, often from line to line, most notably with Rosencrantz and Guildenstern, one a bent-over snark, the other an upright uptight snob, and Claudius and Gertrude when they are together in some scenes. Sweet's most inventive transition is from Horatio to the ghost of Hamlet's father, who uses Horatio as his medium for speaking with Hamlet. When the Ghost departs, leaving Horatio's body, Sweet's Horatio sits on the floor with a "what just happened?" expression. The gag isn't done: Later in the scene, the Ghost wants Horatio to swear on Hamlet's sword, and the Ghost intoning "Swear!" through Horatio to Horatio is fun stuff. All that clothing hanging on the plumbing identifies individual characters. Collett wears a black vest for Hamlet and a black untied bowtie for Laertes. Sweet wears a royal badge for Claudius, a necktie for Polonius, black-frame glasses for Horatio, and a sailor's hat for the Norwegian captain. She carries the shovel for the Gravedigger and a handkerchief for Osric. The two actors share the roles of Gertrude (multicolored shawl) and Ophelia (blue scarf), which, as say the program notes, is "intended as a commentary on the way the male characters objectify them, but also conveniently allows us to keep more of their lines." Directed by Mara Sherman, the production maintains a quick and fluid pace, employing clever choreography for the women to don their characters' clothes without missing a beat. Sweet helps Collett into Hamlet's vest, for example, and the two pass Gertrude's shawl from one to the other as the character passes from one to the other, all while keeping the verse flowing. Watching them manage multiple characters at one time is fun, too. Sweet shifts back and forth between Gertrude (shawl) and Claudius (badge) line to line in several scenes, and Collett fights with herself in the graveyard (choking herself with Laertes' bowtie) and in the climactic fencing duel. The first appearance of Rosencrantz and Guildenstern comes with Sweet as Claudius and Collett as Gertrude talking to—nothing, an empty space. This garners some of the biggest laughs of the night, but after tantalizing us with this device, Sweet assumes the roles of Hamlet's two former friends at the end of their conversation with the king and queen. She makes a good Rosencrantz and Guildenstern, but I wonder how much more fun the invisible friends would be. Given that Sweet and Collett didn't choose to continue that device, however, tells me that it might not be possible. On the other hand, they make the strange choice of having Hamlet play the Player Queen in the Mousetrap, a thematic decision, not a logistic one. Sweet, as the Player wearing glasses with three orange lenses, opens the scene by welcoming us to the "Elsinore Scripts in Play Festival," and recognizes as special guests the king and queen of Denmark. For all the cleverness involved in paring the play down to 80 minutes and its cast down to two—and engaging in "some low-key heresy," as the program notes say—this is Hamlet we're talking about. I've seen this play translated into mime/dance with great success (Synetic Theater, 2014), adapted into commedia dell'arte (Faction of Fools, 2012) and Persian allegory (the Iranian Hamlet, Prince of Grief in 2013) with uneven success, and presented with radically minimal casting (Kate Eastwood Norris at the Folger in 2010, Ted van Griethuysen at Shakespeare Theatre Company in 2014, Bedlam's four actors in 2014, and Shakespeare's Globe's eight actors in 2012) with varying success. As with those adaptations, turning this endlessly fascinating and sometimes-seemingly endless play into an improv-like sketch show comes with pitfalls. Cutting some key scenes and speeches border on high-key heresy, but it must be done if time is your essential factor. Meanwhile, Hamlet's great soliloquies neither soar linguistically nor engage us psychologically, and the plot never gets the chance to be the thriller this play is intended to be. Then, too, I doubt anybody who comes to see A Two Woman Hamlet are new to Hamlet. A Two Woman Hamlet's purpose is to show Shakesgeeks what two talented actors can do with the play in just under an hour-and-a-half run time. Even so, you better bring some intellectually interpretive muscle when you are going to play with Hamlet like this, and these two women do just that. Sweet's take on Polonius resembles a mob boss's operative, and he isn't on very good terms with Gertrude. This interpretation indicates the old councilor has a pointedly close pre-play relationship with Claudius. In the arras scene, Ophelia makes clear to Hamlet that they are being spied upon. The action that follows—the refusal of the love tokens, "get thee to a nunnery," and "Where's your father? "—is play-acting for the purposes of fooling the eavesdropping king and Polonius. This reading stands up textually in this production, but its link in Ophelia's character arc to her eventual madness and suicide seemed tenuous to me. As for the Ophelia madness, Sweet, after slapping Laertes, presents her flowers by using a green marker to draw them on Laerte's arm, then her own arm, and then kneeling down before a patron in the first row and using his arm as a canvas (full disclosure: the patron is Ian Blackwell Rogers, a well-known DC-area actor). Ophelia is treated with profound respect in this production—or, at least her blue scarf is. And so is the shawl representing Gertrude. When Gertrude dies of poison in the final scene as Collett's Hamlet fights Collett's Laertes, Sweet removes the shawl and, with badge on chest, becomes Claudius, who lays the shawl gently on the floor. He folds it and mourns over it so attentively that he's not aware of the crisis heading his way until Laertes proclaims the king's to blame. By the end of this scene, we have a veritable line of laundry on the floor—shawl, badge, vest, bowtie—and yet it's dramatically powerful, not funny at all. 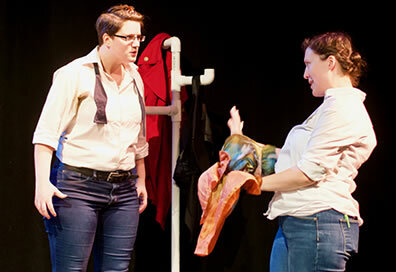 The two women bring their Hamlet home on the right tragic note. One other piece of clothing bears mention. The most notable item, other than the shovel, hanging on the plumbing at the back of the stage is the red coat. It finally is put to use as Collett dons it to play Fortinbras at the play's end. In A Two Woman Hamlet, Fortinbras has been hanging over Elsinore through the entire play. These two women know what their Hamlet is about.